29 Piece Ow-Wee kit, Mini Plastic Case - Kids First Aid should be fun - and this little First Aid kit for children is. 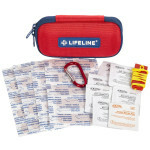 Ideal for a backpack or bike bag, our Ow-Wee kit was developed with kids' minor emergencies in mind. - (6) Adhesive adhesive plastic bandages, 3/4" x 3"
- (10) Junior adhesive plastic bandages, 3/8" x 1-1/2"
- (3) Patch adhesive plastic bandages, 1-1/2" x 1-1/2"
Kit Dimensions: 4-3/4"x3-3/4" x 1/2"
Ow-Wee Kit, 29 Pieces - Mini - FAO-181.